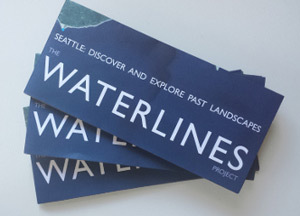 The Waterlines Project Map (PDF) is a rendering of the Seattle area in the mid-19th century, just prior to non-Native settlement, created using photorealistic aerial views collaged with hand painting. The map content integrates research from the sciences, natural and cultural histories, with an admixture of informed imagining. The place names on this map, written in the Lushootseed language of the Coast Salish people, are drawn from elders who worked with ethnographers in the early twentieth century, from the work of linguists and scholars such as the late Vi Hilbert, and from an atlas created by Coll Thrush and Nile Thompson for the book Native Seattle. Place names are stories: proof of presence, archives of meaning, evidence of ancestry, and a reference for treaties and other legal connections to territory. They provide context to the ongoing presence and strong connections to the city for Native people as co-managers of our shared resources. Refer to “An Atlas of Indigenous Seattle” for further information on the Native place names found on this map. The historical landscape conditions are based on mapping done by the Puget Sound River History Project for guiding regional issues of resource management, restoration, and environmental planning. These studies can inform urban design decisions related to green infrastructure, flood management, and other contemporary planning issues surrounding sustainability and resilience. For further information on the Puget Sound River History Project’s research and methodology please see “Reconstructing the Historical Riverine Landscape of the Puget Lowland”. On the reverse side are four tours of the area’s history presented through the lens of its changing landscape with a timeline going back 20,000 years. Information on Native foods of the region can be found at the Burke Museum’s Salish Bounty page. 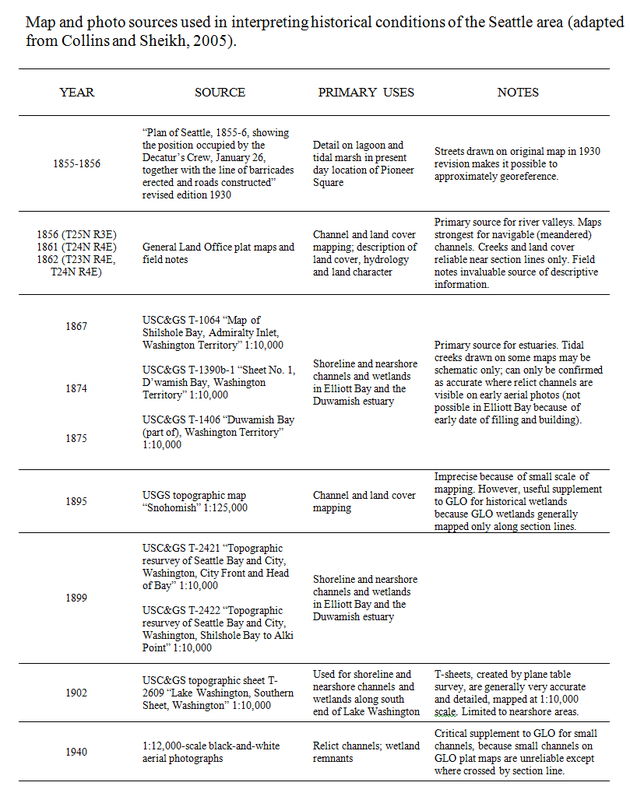 Example of historical map and photo sources used in interpreting historical conditions of the Seattle area (adapted from Collins and Sheikh, 2005). Klingle, Matthew W. 2007. Emerald City: An Environmental History of Seattle. New Haven: Yale University Press. Kruckeberg, A. R. 1991. The Natural History of Puget Sound Country. Seattle: University of Washington Press. Pojar, Jim, A. MacKinnon, and Paul B. Alaback. 1994. Plants of the Pacific Northwest coast: Washington, Oregon, British Columbia & Alaska. Redmond, Wash: Lone Pine Pub. Williams, David B. 2005. The Seattle Street Smart Naturalist: Field Notes from the City. WestWinds Press. Production by Amir Sheikh in collaboration with Brian Collins, Don Fels, Peter Lape, Joyce LeCompte, Coll Thrush, Cynthia Updegrave, and David Williams. We thank the many knowledgeable people who have provided additional contributions and critical reviews, including Brian Atwater, Brian Boram, Steve Denton, Jolene Hass, Warren King George, Lorraine McConaghy, Jess Milhausen, Megon Noble, Laura Phillips, Aaron Raymond, and Ken Yocom. Map designed by Michael Lewis and Jordan Monez of About Nature. Waterlines is a project of the Burke Museum. This project was supported, in part, by an award from 4Culture. © 2014 Burke Museum of Natural History and Culture. All rights reserved.